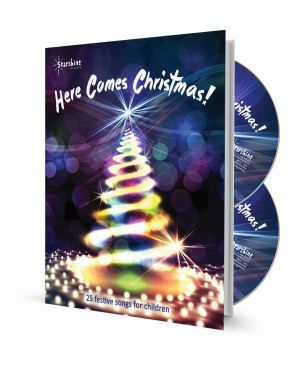 'Here Comes Christmas' is packed with sparkling songs that children will love to sing, with great new repertoire as well as some previously unfeatured favourites from within the Starshine catalogue. A refreshingly festive collection for Primary phase, 'Here Comes Christmas' will prove particularly useful for young choirs, as many of the songs feature easy harmony and counterpoint. Ideal for Christmas concerts and assemblies. "A wonderful selection of songs to help bring Christmas alive. With a mixture of traditional and modern sounding songs, these are pieces to fit all different Christmas events. Pitched perfectly for the voices of primary age children and with beautiful harmonies running throughout, these songs are a fun way to celebrate Christmas!" ~ B Gee, Teacher, Gloucestershire. Just wanted to let you know that last night our (KS2) choir sang 3 songs from 'Here Comes Christmas',in our candlelight carol concert: Silent Night, Shepherds Wake Up, Christmas is Coming. They were all commented on positively by different people. We loved the melody & harmony in Silent Night, had a lot of fun with Shepherds Wake Up (adding some hand jives!) and the words of Christmas is Coming were appreciated by many - the children also loved this song in particular. We added some solos to this one too. Thank you for great songs. We very much look forward to using more of these songs next Christmas! A very good selection of songs and styles, easy to pick up but complex enough to engage both children and the audience, and harmonies are effective. An excellent resource. We are loving these songs! Review by Becky Gee - Teacher, Glos. A wonderful selection of songs to help bring Christmas alive. With a mixture of traditional and modern sounding songs, these are pieces to fit all different Christmas events. Pitched perfectly for the voices of primary age children and with beautiful harmonies running throughout, these songs are a fun way to celebrate Christmas!